Seeking to bring the quality of ‘big city’ pizza to the Nashville area, local owners Kelly and Caroline Black opened Pie in the Sky Pizza on Valentine’s Day in 2001. PITS offers both traditional and gourmet pies, but is also known for its pastas, hoagies, calzones and wings. We’ve dined in and taken out from two (Cool Springs and Lenox Village) of the three (+ Vandy / Midtown) locations, picking up a hot pizza in Cool Springs for this evening’s review. Pie in the Sky’s traditional “Signature” crust is of the thicker, hand tossed variety. The crust is fluffy and soft in the center with a crisp, crunchy exterior from the heavy dusting of cornmeal. Beware: the application of cornmeal has been known to get completely out of hand. This evening's quanity was only mildly excessive. The crust doesn’t have any dominant flavors or spices of its own, serving more as a texture placeholder and a plate for the toppings. The sauce is thick and applied a little heavier, leaning more towards Chicago than New York in both flavor and quantity. Forgoing the spicy tinge that many sauces carry, it is very straightforward with the tomato puree and traditional Italian spices. We’re talking tomato tomoatoey tomatoeness. Thick, direct tomato flavor. You better like that. The cheese is a tasty mozarella with an outstandingly high pull-away factor and the pepperoni was above most on freshness and flavor. PITS offers ample table and booth seating along with a full service bar and closed-off dining areas for parties. Now, I’m no accredited interior designer, but the decor confuses me. It seems to take any slight reference to the “sky” portion of their name and run with it, futilely meshing some form a rocket / space theme with a clouds / flying theme and even an angel theme. Both the Cool Springs and Lenox Village locations include an over-sized mural of those hideous baby angels looking to the sky, while each table features a space age plasma lightning lamp. We’ve always had great service at PITS, but we typically take out in lieu of dining in due to the same dominant demographic that many pizza joints attract. At off-peak mealtime hours, however, all three locations offer full service bars with several high definition TVs for sporting events. On the whole, Pie in the Sky serves up a nice pizza, certainly a cut above the standard delivery chains. It's a little pricier than some, but the ingredients are fresh, the pizzas are made-to-order and they offer a wide variety of gourmet toppings. I just prefer a little more happening in my sauce beyond TOMATO and I can't seem to get over the sawdust taste that all that cornmeal leaves in your mouth. But, as LeVar Burton says, "you don't have to take my word for it..."
I don't know where they ran off to! Today is Ulika member Joe Colvert's birthday (also Johnny Cash's birthday). Happy Birthday Joe and Johnny! Joe has been with team Ulika from the beginning, but Joe's roots are in Alabama. In fact, the majority of his family currently resides in Daphne, AL "The Jubilee City". The name Jubilee comes from the "phenomenon" that brings blue crabs, shrimp, and various fish from the bottom of the bay into the low waters along the beach shoreline. Byron Chism of Buttrub.com fame was so inspired by the "phenomenon" that he created a Seafood Seasoning calling it Jubilee. This seasoning is in the same mold as Old Bay with its strong celery salt base flavor. I use it when seasoning almost all of the seafood I cook, and I love how it complements all seafood dishes. Try some out yourself here. Now onto the music. In 1994, blur released the album Parklife. I was in the 8th grade when a classmate first played me this record and I was hooked from there. blur is most notably recognized for their hit Song 2. A song that you have heard even if you didn't realize who it was. 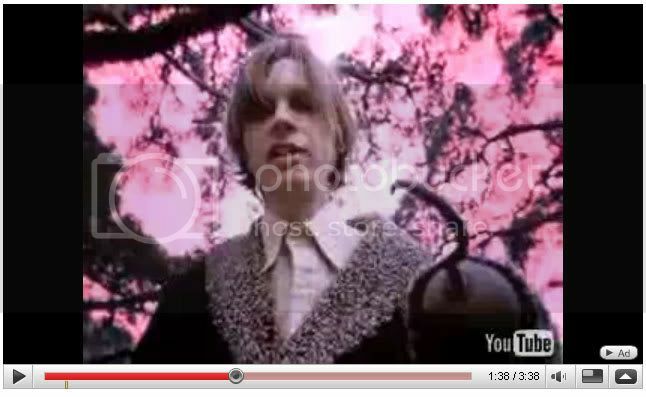 I am pretty sure that this song was in no way inspired by the "phenomenon". This is another sauce from a famous barbecue restaurant in Alabama that I've never been to. The Gibson name is synonymous with barbecue in North Alabama. There are no less than five separate places in the Huntsville-Decatur corridor that bear some variation of the Gibson name - Gibson's, Little Bob Gibson, David Gibson's, and of course the originator, and most famous of them all - Big Bob Gibson Bar-B-Q. Big Bob first started selling barbecue in 1925, and it has been in the family ever since. Today, under the direction of great-grandson-in-law Chris Lilly, it is one of the best-known barbecue restaurants in America. Big Bob Gibson is perhaps best known for their unique white barbecue sauce for chicken, but they now offer a variety of different sauces, including this specimen - the "Championship Red Sauce." 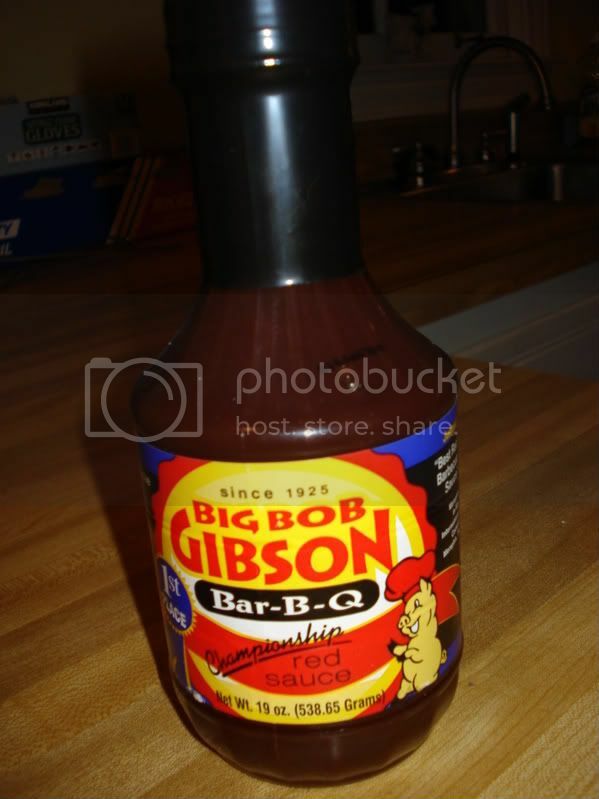 Although the bottle claims that this sauce has been over 70 years in the making, the story on the Big Bob Gibson website is that Lilly set out to create the sauce in 1995. Either way, the list of ingredients definitely shows signs of tinkering (two different "steak sauces"?!). This sauce has won "Best Sauce on the Planet" at the American Royal, but it's not a sauce that comes off as especially spectacular. There are no outrageous flavors or over-the-top spices. It's just a good, basic product that tastes like most people expect a barbecue sauce to taste - smoky, sweet, a little bit tangy. Sometimes I'm convinced that that's the path to success in the competition world (where Lilly and BBG have had considerable success). Bold and unique flavors can be divisive - people love them or they hate them. Maybe in competition, you're better off casting a wider net. I recently received a cookbook from the Charleston restaurant Cypress: A Lowcountry Grille. The book was written by Executive Chef Craig Deihl who created the menu and has commanded the kitchen at Cypress since 2001. I am always excited to look at new cookbooks and I especially enjoy ones that have great photographs - this cookbook gets some high marks for the quality images. Cypress is known for its unique blend of lowcountry traditional fare with more exotic, global flavors. With Deihl's descriptive, easy-to-follow recipes and such excellent photography (from photographer Rick McKee), I was eager to dive in and try my hand at a dish. I found a pretty easy recipe for Steak Diane with Roasted Mushrooms, Gruyere Potato Fondue and Truffle Cracked Peppercorn Cream. Of course, I changed it up a little and did a Ribeye steak instead of a New York Strip. I also substituted a balsamic cream for the Truffle Cracked Peppercorn Cream. The steak was prepped simple with salt and pepper, then grilled on the Big Green Egg. The Gruyere Potato Fondue was very creamy - it had a heavy, rich, velvety consistency - and the Gruyere cheese provided a nice, subtle complementary flavor to the beef and mushrooms. Unfortunately I do not have a full review for you (an excuse to go back! ), but I want to give a special shout-out to Papa Boudreaux's Cajun Cafe. I finally made it to this tiny little restaurant in Santa Fe, Tennessee tonight and I was very impressed. I am by no means an expert on Cajun / Creole cuisine, but as a Middle Tennessean, this was without a doubt the best that I've ever had. It's about an hour away, down the Natchez Trace Parkway. I went with my Uncle Dave and we had gumbo and crawfish & shrimp étouffée - both absolutely outstanding, and finished it off with chocolate bread pudding, which was rich and delicious. NOTE: Papa Boudreaux's does not accept credit or debit cards - only cash or check. Uncle Dave and I discovered this only after we'd ordered, and we panicked. But the nice people working there said not to worry about it, and gave us the restaurant's address to MAIL THEM THE MONEY! 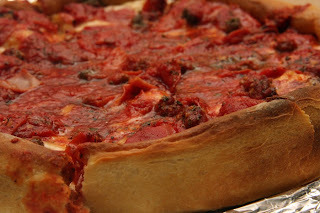 This week has been a rather controversial one for our old friend, the Chicago-style deep dish pizza. An article published in this Tuesday's Chicago Tribune follows historian Tim Samuelson as he digs into conflicting legends about the dish's original creator. Former Texas football star Ike Sewell of Pizzeria Uno has long been credited with selling the first deep dish pie in 1943 and has almost always been given the nod for creating it as well, but now different theories persist regarding the inventor(s). Following various paper trails and family testimonies has led Mr. Samuelson to the names of two other men, Ric Riccardo and Rudy Malnati, who worked with Sewell in the mid-1940s, serving "pizza thick as a sewer lid and almost as heavy." Riccardo went on to open his own Italian restaurant (Riccardo's, closed in 1989) and Malnati's sons now have their own Chicago pizza chain, Pizano's Pizza. Sewell may have claimed the fame, but which of these men deserves the real credit is still a mystery. I noticed the appearance of the new Chicago Style Italian Beef restaurant on Nolensville Road sometime last fall and simultaneously began hearing about it from different circles of friends. Several people had stopped by to pick up a sandwich from the odd location at the end of the Aquatic Critter strip-mall on Nolensville Pike, but I hadn’t heard any reports on the pizza. 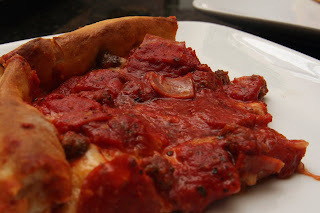 Last Friday night, we decided to dive in try the Meat Lover Chicago Style Deep Dish Pizza. Now, when it comes to Chicago-style pizza, it's all about the crust and the sauce. You're looking for a fat, fluffy, buttery crust and gobs of thick, chunky tomato sauce - straight up crushed tomatoes are not uncommon. Spices come and go, but a heavy, direct tomatoey taste is a must. These pizzas are heavily doused with a mozzarella-dominant blended cheese and, since it's Chicago, Italian sausage is typically the meat of choice. And of course, the proper deep dish pie absolutely requires a knife and fork. Sadly, I must report that the pizza was a complete disaster. The ho hum, nondescript cheese was applied so scarcely that I had to fight to find and taste it. It atleast tried to be a blended cheese, blending bad mozzarella with another cheese (maybe - could it be? - ricotta) that resulted in some overall consistency issues. I can't rate the pull-away factor as there was not nearly enough cheese present to pull. The meat was scarce as well, both in quantity and in flavor, but nothing could match the utter horror that was the sauce. I have eaten pizza from the gas station. I've had it at high school basketball games, Chinese buffets, and microwaved it from hotel vending machines. I've eaten every variety of frozen pizza...but I have NEVER had pizza this bad and it can all be blamed on the sauce. I just can't say enough about how hideously unbearable and inedible it was. Aside from the fact that it was WAAAAYY over-spiced with basil and thyme, oddly matched with a peculiar, unfitting hint of sweetness, the tomato taste was completely omitted. I only assume tomato was ever involved because the sauce was red. You won't believe me when I tell you this, but the sauce tasted exactly like Japanese miso soup. Could there have been some sort of mistake? I even did the full sauce wipe away, but could not escape the lingering flavor. It ruined what was once good crust. I was so excited and eager to try this place and wanted so badly for the pizza to be good. Now I just feel sad and hurt by this experience. The Mr. and I both agreed that this was the worst pizza that we have had, throwing away all but the one slice each that we tried. Sorry. Please, someone else try this place and tell me that I'm crazy. ...I got 2 turntables and a microphone. Beck's Odelay ranks in my personal top 10 albums of all time. With hits such as Devil's Haircut, The New Pollution, and this weeks Music Thursday selection Where It's At. George White began experimenting in his kitchen with a barbecue sauce recipe in 1994. One year later, he was selling his sauce to local grocery stores in the foothills of the Sierra Nevada Mountains in Northern California. But after a painful divorce in 1998, George gave up on his sauce business and moved to Las Vegas. Nearly ten years later, at a poker game, George met a woman from Tennessee who shared his interest in barbecue. After tasting a batch of his sauce, she offered to go into business with him. 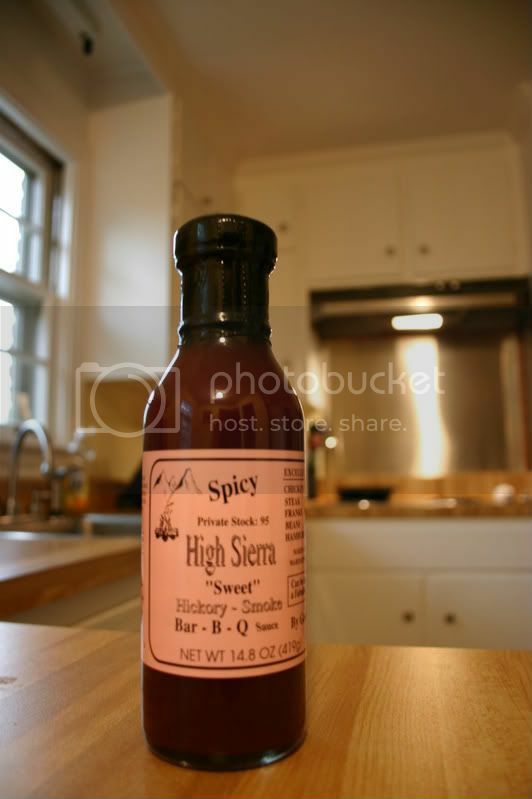 Thus, High Sierra Enterprise, Inc, which sells barbecue sauces and rubs - with headquarters in Las Vegas, Nevada and Murfreesboro, Tennessee. The bottle that I ended up with is the "spicy" version of the sauce, but it's hard to imagine that the "original" could be any milder, as there is really no heat to speak of. What this sauce does have a lot of, as announced in one of the scattershot phrases on the label, is hickory smoke flavor. In fact, it's one of the smokiest sauces I've had. The smoke first makes itself known in the aroma, then in the flavor is joined by a rich brown sugar and molasses sweetness, as well as a prevalent onion flavor. There are bits of chopped garlic floating in the dark burgundy colored sauce, which is fairly thick. 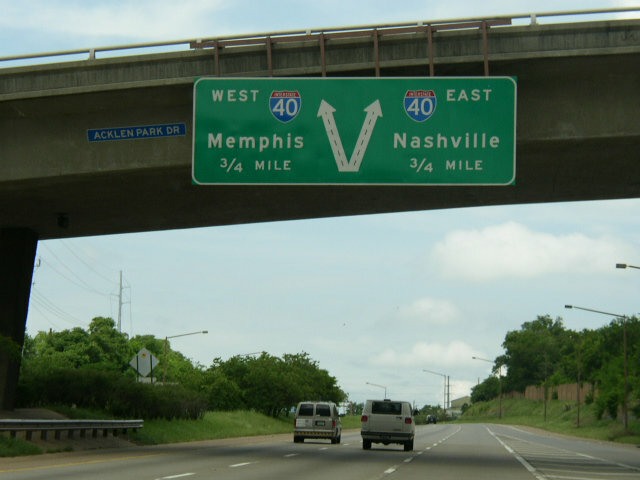 A mere 200 miles separate Nashville and Memphis - about a three hour drive. But culturally, they are further apart than that. I won't go into all of the differences here. For our purposes, I'll keep it to this - Memphis is known as a "barbecue town"; Nashville is not. Thus it's no surprise that a couple of Bluff City establishments have seen fit to set up shop in Middle Tennessee and attempt to show us how it's done. To be fair, Corky's has actually opened franchises throughout the Southeast. There are a total of 20 locations outside of the greater Memphis area, and three of them are in Middle Tennessee. The Brentwood location was the first to open outside of West Tennessee. It's been there now for over 15 years, which makes it practically ancient by Brentwood standards. It is a full-service restaurant, complete with waitstaff and cloth napkins. Although I have been eating at the Brentwood Corky's most of my life, the original location on Poplar Avenue in Memphis was new to me when I visited there last year. The pulled pork sandwich came pre-sauced and with the slaw on the side. The pork came in big meaty chunks, which were a little tough - not cooked to the same tenderness as the Memphis location. Flavor-wise, the sandwich was leaning heavily on the barbecue sauce, because the pork was relatively bland, and so was the slaw. The "dry" ribs were a little better, though every version of this Memphis specialty seems to pale in comparison to the Rendezvous', just because their rub is so unique and awesome. By comparison, this generously applied rub had very little depth of flavor - it just tasted salty. Great cut of meat, though - well trimmed, with lots of meat on the bones - and well cooked. As you can see in this Southern Foodways Alliance piece, a big part of Corky's M.O. right from the start was offering quality barbecue in a "safe" location. "Everybody thought that when you wanted good barbecue you had to go into a bad neighborhood- in ghetto or it's not going to be good barbecue. Well, like he said 99% of the people that want to eat the barbecue don't want to have go to the ghetto if they don't have to." Perhaps their standards for quality have declined through the years, but they have remained successful by bringing the "barbecue experience" to the suburbs - and the Brentwood location is no exception. My Neely's experience in Memphis was considerably better than the experiences I have had at their Nashville location. While the atmosphere in their Memphis branch was great, I have always loved the vibe of the Nashville location, despite the fact that it is in Fountain Square. It's in the space that once was either Hooters or Fat Tuesday, I can't remember which. Probably Hooters. Anyway, it's a large open space, with a covered deck in the back, overlooking the lake. The staff are always friendly and the blues music is always loud. One thing that I specifically wanted to try in this visit was the chopped pork sandwich. In previous visits, I had ordered the ribs, usually with disappointing results. The pork sandwich in Memphis was a winner, though, and I wanted to see how this one would stack up. It stacks up very well. Excellent pork, not just pulled but chopped - had great flavor and great texture. The barbecue sauce at Neely's is not too sweet, relying more on vinegar, ketchup and Worcestershire flavors to enhance the pork. The slaw, as you can see, was generously applied and really topped things off nicely. The slaw, rather than the barbecue sauce, provided most of the sweetness. And the slaw was esepcially fresh and crisp, which added to the wonderful textural variety of this sandwich. This is the best Memphis-style sandwich that I have had outside of Memphis. The ribs, unfortunately, failed to capture the same magic of the original location. They were, as they have usually been, soggy, overcooked and flaccid, tasting as if they had emerged from a crock-pot full of barbecue sauce. You may be wondering what the heck that spaghetti is doing on the plate. But that's not just any spaghetti, Dear Reader, that's barbecue spaghetti - another Memphis specialty. It has plentiful bits of chopped pork in a sauce that's part spaghetti sauce and part barbecue sauce. You can order it as an entree or a side item. It's a fun change of pace that is actually pretty tasty. Disclaimer: Please note that these reports are based on particular servings of barbecue at a particular day and time. Barbecue can be prone to fluctuation. Your experiences may vary. 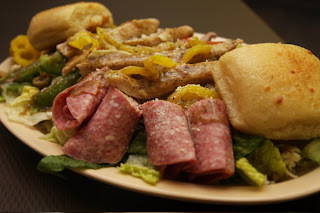 Part 19 - "Barbecue by any other name..."
Rudino’s Pizza and Grinders is a family-owned restaurant that opened in 2002 in Antioch. 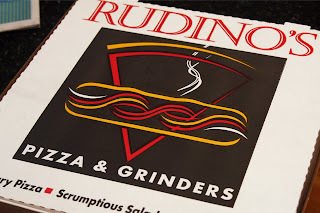 The Rudd family opened the original Rudino’s in North Carolina back in 1995, starting as a single restaurant which has now expanded to include 16 locations in the two Carolinas, plus the rebel location here in Middle Tennessee. They offer a wide variety of pizzas with both traditional and specialty toppings and an even wider variety of grinders, along with calzones, soups, salads, appetizers and desserts. 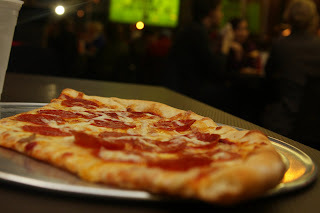 The dough is hand-made daily, complemented by homemade sauce and fresh-cut toppings. 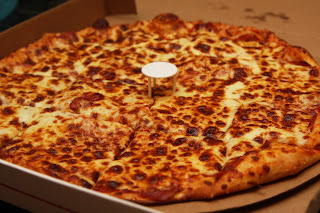 The traditional Rudino’s pizza is cut diagonally and horizontally like a St. Louis-style pie, also known as the party cut, divided into medium-sized squares. 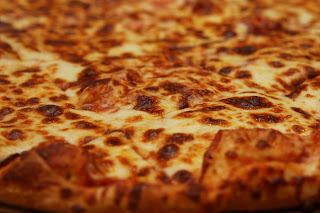 The hand-tossed crust is thinner on the base of the pizza with soft, puffy edges full of air pockets. There aren’t any particularly dazzling flavors that stand out in the dough, but it is a good, solid crust with an excellent texture. The simple, thin tomato sauce sauce is spread lightly across the crust and has tinges of both spice and little sweetness neatly blending into the crowd of remaining ingredients. 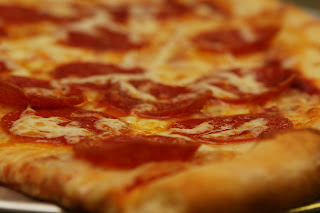 A dense, shoulder-to-shoulder, covering layer of juicy and thinly sliced pepperoni is placed over the top of the sauce. 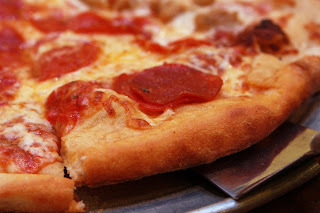 The pepperoni is decently spiced without being too hot or intrusive, but you surely won’t miss out on its flavor as it truly covers every inch of the pie forming a slick barrier between the crust and cheese. The cheese, however, will not be outdone in flavor or in quantity. It is tasty, heavy, milky mozzarella cheese with the highest pull-away I’ve found on a pizza thus far. It covers the top of the pizza, applied with reckless abandon… the most cheese I’ve seen atop a pizza (and while sometimes I do, I did not order extra cheese). On the evening of this review, we ordered to go. I was very pleased to find that a fresh, warm pizza was ready for us to pickup and the same fresh, warm pizza was ready for us to eat when we got home. For dining in, the family-friendly restaurant has both large and smaller booth seating with décor celebrating local sports teams. An outdoor patio is open on the restaurant’s corner lot in the warmer months. The restaurant provides simple, clean, no-frills service with paper cups and plastic trays, probably helping to keep the prices more reasonable. 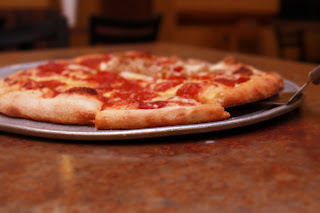 Overall, our sampling of Rudino’s pizza was delightful – tasty and a little different. It isn’t fancy or gourmet and it isn’t reinventing one of America’s favorite dishes, but it destroys any of its competing take-out/delivery chains with a good, solid product. noted upside: Rudino’s also offers Blue Bell ice cream for dessert. 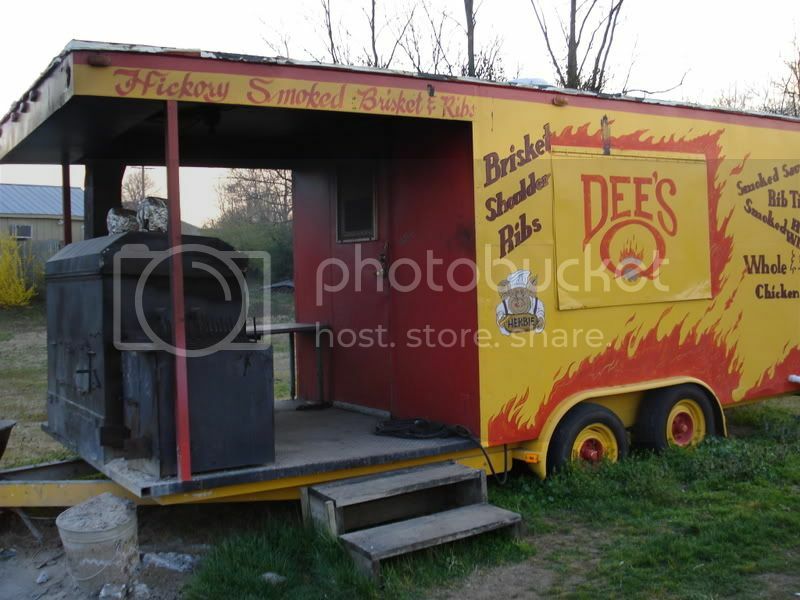 As reported on the Nashville Scene Bites, Reggie Crowder, the owner of Dee's Q, has died of a heart attack. Keep Reggie and his family in your prayers as he was a great ambassador for the Nashville Q'ing community. From the title some of you may be thinking that I have gone crazy. There is nothing more opposite than Britney Spears and this blog, but don't worry my dear readers I am not going to post any Britney videos on here. Today I bring you the band Travis covering Britney's song Hit Me Baby One More Time. Now, their version is a little slower and not as slutty, but I think that you will enjoy it more than the original. Travis first busted onto the scene with their second Album The Man Who which featured the song Why Does It Always Rain on Me. That album won them a BRIT Award (equivalent to a Grammy), and they have been playing sold out shows all over the world ever since. One of the reasons that Travis has been able to sustain a 10+ year career is the fact that they put on a great live show. They like to mix it up with other covers like The Band's The Weight, John Lennon's Gimme Some Truth, The Beatles' Here Comes the Sun, AC/DC Back in Black, Elvis Presley's Suspicious Minds, and Katy Perry's I Kissed A Girl. 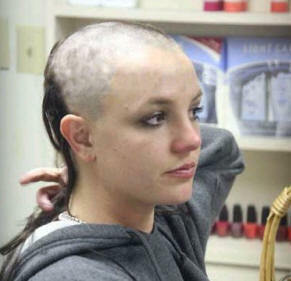 Sit back and enjoy this weeks selection, but get that mental image of Britney out of your head. What is your favorite cover of a famous song by another band? If you are tired of the plain old Ulika Food Blog, try it wrapped in bacon. I suppose that this edition is a testament to the tough economic times that have hit the restaurant industry especially hard, as two of the three places I wanted to include in this report have gone out of business. Nashville's west side has never been especially rich with barbecue restaurants, but now we are down to just one non-chain establishment. I'm not sure when exactly Lonnie's BBQ Bar bit the dust. I ate there a couple of times soon after it opened and was very unimpressed, so it fell off of my radar screen. For those of you not familiar, this place was behind a Pizza Hut in the back half of a shotgun building on West End Avenue, across the street from Valentino's and the St. Mary's Bookstore. You can find a more proper review here. Unlike Lonnie's, Fate's Pig & Pie was one of my favorite Nashville barbecue places. It began in early 2000 in a roadhouse-style location on Charlotte Pike, which was fantastic. In my opinion, that place was the quintessential southern barbecue joint. Then they dropped the "Fate's" from the name (parting ways with co-founder Fate Thomas Jr, I assume) and moved to...the Bellevue Center Mall?!!! Yes, a barbecue restaurant in a mall. I will never understand it. And to add to the confusion, they were only open on Fridays and Saturdays. Still, even though the atmosphere was horrendous and the hours were constricting, the barbecue was still very good, and I stopped in as often as I could. But late last year, an agreement was reached to sell the mall to a new developer who is going to turn it into an "outdoor lifestyle center." Thus, the mall - and Pig & Pie - have been shuttered. I still see their catering truck around town, and they still have a website. Here's hoping that someday soon they can get back into the restaurant business, and preferably not adjacent to a Sbarro and an Orange Julius. Paradise Ridge Grille appears to be still going strong. Although this West Meade establishment serves a wide variety of food items, from meat & three to chicken wings to steaks and pasta, barbecue is the foundation. This is one of the few restaurants in town that began as a competition barbecue team - and a very successful one at that. The entire restaurant is decorated with trophies and plaques won by father-and-son duo Buddy and Charlie Babb's Paradise Ridge Barbecue Team. The awards are impressive, but can they pull it off in a restaurant? The barbecue pork sandwich looked fantastic - toasted bun, lots of coarsely pulled pork shoulder, with lots of bark pieces included. I tasted the pork by itself first, as I always do, and was somewhat underwhelmed. The texture was good - very tender, with the bark pieces providing a nice contrast, but the taste came off as rather bland and underseasoned. What the meat lacks, though, the excellent house barbecue sauce makes up for. It's sweet and smoky, but not too thick, with plenty of interesting flavors in the mix. So overall, with sauce applied, and the meat on a nice toasted bun, it's not too bad. The ribs played out in a very similar fashion. They were cooked just to just about perfect tenderness, but unadorned, they just did not carry very much flavor. Of course an application of sauce made things better. In 1983, brothers Amir and Ali Arab along with friend and partner Raouf Mattin opened a small pizza parlor named Pizza Perfect in the town-square-style “stripmall” across from David Lipscomb University on Granny White Pike. I grew up just down the street and I have fond memories of the establishment – it was an especially special treat on snow days when we would trudge through the slush and ice to enjoy the delicious, hot and steamy pies (and doughnuts – they originally sold both pizza and doughnuts). The owners were always there, always happy to talk to customers, always hand-rolling dough in the small, peek-in kitchen. This place holds some of my earliest memories of fresh, homemade pizza. With its previous neighbors, Perfect Burger and Perfect Laundry, the original décor included the Ten Commandments, handwritten (in formal cursive) on the outside face of the building. Over the years, alongside a revolving door of neighbors, a lot more than the décor has changed at Pizza Perfect. 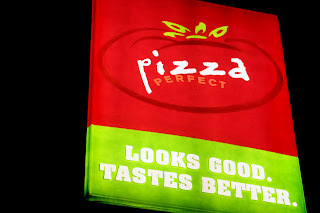 The secret was out about the fabulous and fresh “perfect” pizza by the late 80s, and the brothers decided that it was time to expand. In 1990, Amir and Ali opened a new Pizza Perfect on 21st Avenue between Vanderbilt and Hillsboro Village – splitting from Raouf. Now the brothers own both the Vanderbilt location and the Bellevue location (opened in 1997) of Pizza Perfect, while Raouf separately owns and runs what is now called Pizza Perfect Kebob in the original Granny White location. 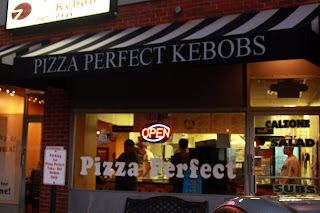 When Pizza Perfect added the Kebobs and began sporting a jazzy new black awning with their name professionally printed on it, I knew something was up. I hadn’t visited the location in quite a while and I was very nervous as I walked in when I saw – gasp – one of those glass counter-top warming cases. You know, like the ones that they have inside gas stations that specialize in producing soggy, rubbery pizza. This did not look promising for those ordering by the slice – but thankfully, we were ordering a whole pie. One expects a reasonable wait at a local pizza restaurant as the pies are made to order, but when the restaurant is barely keeping patrons in half of their seats, 45 minutes is a little much. After checking with us (and with others) to confirm our order, our piping hot pizza emerged from the kitchen. The fact that it was hot was unfortunately its best feature. The crust was completely bland and a little tough, the sauce was screaming “I came from a can!” and the pepperoni was chewy with little to no spice. The cheese was acceptable, a basic mozzarella with a medium pull-away, but not dazzling enough to save the ship. I saw dough being rolled as I walked by the kitchen, so I suppose they can claim that something is handmade. But after the first slice of this pizza, I had to wonder what could have taken 45 minutes – maybe the pepperoni had to thaw before it could be sliced? Maybe the can opener was jammed? Maybe they were working on their really great website? As I mentioned, barely half of the tables were seated on the Friday night when we dined in. The décor definitely leans more towards the Kebob theme than the pizza theme with standard booth and small table seating. You order at the front counter and then your dinner is brought to your table. It was oddly quiet with very low music that made me feel like I had to whisper. The restaurant does have a few pluses: free refills from the soda fountain and a video game arcade (a nod to Mr. Gatti’s, perhaps). All in all, the pizza wasn’t absolutely horrible, just not too good. Roughly on par with Pizza Hut. I wanted so badly to like it...maybe we should have tried the kebobs? Now this is more like it. Pizza Perfect slices their modified New York-style pies in medium-large triangles, serving the traditional pepperoni pizza with a base of sauce, then cheese, then pepperoni…then more cheese. The medium pull-away cheese is pretty good, definitely better than your average mozzarella while the pepperoni slices are fat and flavorful. The sauce is intensely tomatoey - very thick and full with a bold, fresh tomato taste. It was applied a little heavier than I expected, especially around the inner rim. Now I like a lot of sauce on a Chicago-style pie, but here, I had to do the wipe-away towards the end of each slice. But oh, the crust. This is some of the best crust I’ve found on a pizza. They claim that its made and hand-tossed daily and I believe them. It’s a thin-style crust that isn’t too thin or too hard, just warm and soft with a little crunch around the edges. A big downside to hand-tossed crust is the often overwhelming presence of cornmeal or flour on the bottom of the pie - the bottom of the pizza hits the top of your tongue (where all the tastebuds are), and suddenly you feel like you’ve bitten into a pile of sawdust. Pizza Perfect’s pie, however, had no cornmeal or flour playing spoiler on the bottom, just a heavenly, slightly buttery taste. The reigning champ of the Nashville Scene Readers’ Poll was lively and energized on the Friday night when we visited, busting at the seams with patrons. It was a very cold night, but the outdoor heating system was outstanding and we could barely believe that we were sitting on the front porch with nothing but plastic sheets between us and the freezing air. This is also an order-and-sit restaurant, but with a quicker turnaround than I expected (especially for a Friday night). I haven't uncovered any hidden gems (yet), but all in all, this was a great evening of great pizza. Well, it's that time of year again...yes, it's Grammy time. On Sunday night, the red carpet pandemonium, the long, drawn out acceptance speeches and the drunken after parties (or lack thereof) will invade Hollywood for the 51st Annual Grammy Awards. Now I am not one for awards shows, but I always like to find out who is awarded the Album of the Year. BP and I were recently discussing how creating an actual album is becoming a lost art. In this day and age, iTunes rules the music industry and kids just want to fill and refill their 160 gb of storage with the song of the minute. In turn, the artists errrr... pop musicians are trying to turn out the next great hit in hopes of being the top download of the day. Me personally, I still like to listen to full albums. Albums are not just a bunch of songs thrown on a CD. 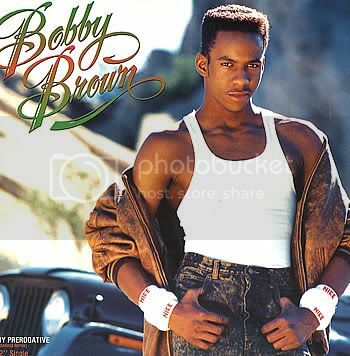 Great albums tell a story, bring out emotion and inspire people. The song order selection is intentional. The production is precise, flowing from song to song. Maybe one day the record industry will value the album again, but in the mean time we will just have to hope that Lil Wayne does not go into history with the likes of Bob Dylan, The Beatles, Stevie Wonder and Frank Sinatra. At least I am familiar with three of the five albums... I do not know the music of Lil Wayne and I have never heard of Ne-Yo. I will put $100 on Raising Sand performed by Robert Plant and Alison Krauss. This combo of Plant and Krauss crossed several music boundaries and seemed to please the masses. Plus, Alison Krauss was my wife's neighbor when she (my wife - the mrs.) was in highschool. So who is your favorite to win Album of the Year? Creole barbecue sauce? Yep, that's a new one on me, too. But it's at that unlikely intersection that Season's Harvest has positioned their Deep South barbecue sauce - "a Creole based sauce that has a spicy taste with just enough zest to do the job." If the name Legend sounds familiar to you, you may remember that we reviewed another in that line of products last year - Legend's Apple Cider for Pork barbecue sauce. 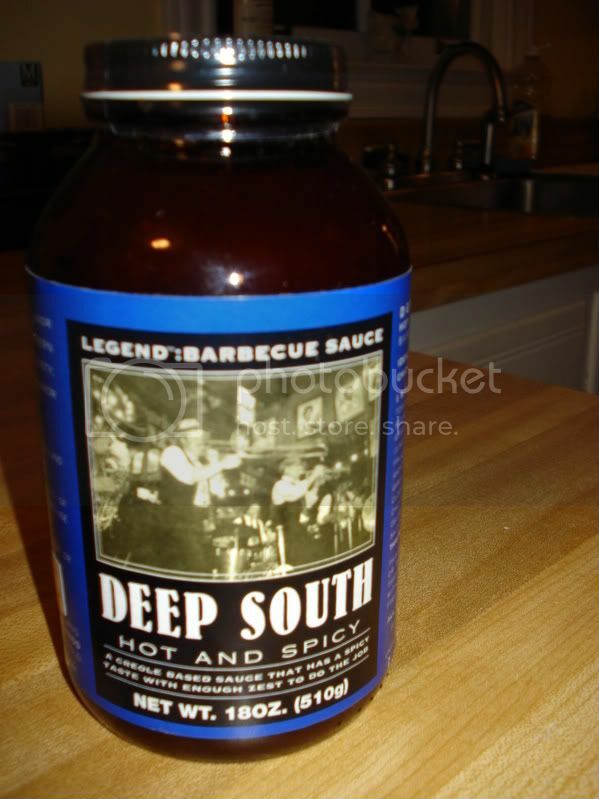 The Deep South sauce is from their line of "regional" barbecue sauces. The sauce comes in what looks like a large pill bottle (complete with dark brown tint) and the label has a retro photo of New Orleans jazz musicians. When uncapped, it yields an aroma strong of Worcestershire sauce and molasses. The taste is instantly familar as barbecue sauce - sweet and smoky - but other flavors quickly emerge that proclaim this sauce's uniqueness: chili powder, cumin, paprika, and perhaps even sassafras? The Cajun/Creole theme is advanced by a mirepoix of diced onions, celery, and bell peppers suspended in the thickness of the sauce. And lest you forget that this sauce is named "Hot & Spicy," there is a hearty dose of Cayenne pepper which turns the heat up well past mild. Overall, a very interesting sauce, if maybe a bit overpowering. Clearly, the most popular girl in school this year is BACON. 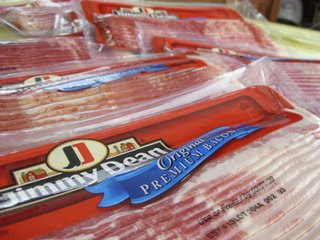 From the Thanksgiving TurBACONducken to the recent BBQ Addicts internet phenomenon, everyone is simply mad over bacon. I like to think that we here at the Ulika Food Blog are the ones who started this whole frenzy. You see, we've been eating bacon for years. It was, after all, BP who introduced the chocolate Bacon bar and placed a few slices of those tasty pork strips on his PB&J MONTHS ago. 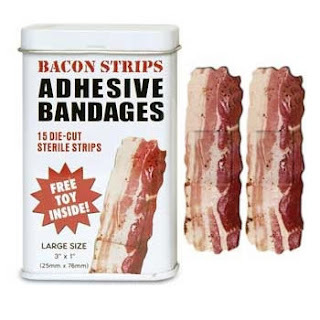 We told you about the bacon Halloween costume, the bacon briefcase, the gummy bacon strips and the bacon band-aids. 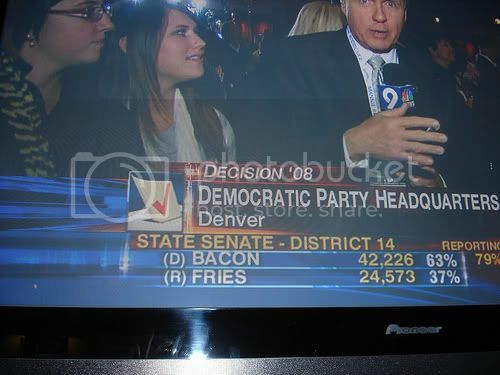 And we were the ones who celebrated the victory of BACON over fries. To keep the beer hot? To provide traction? And now, keeping with those healthy New Year's resolutions, one man has vowed to eat nothing but bacon for the entire month of February. We know it's tasty, but who would have known that the cured belly of a swine carcass could be so trendy too. Stay classy, bacon. We love ya.